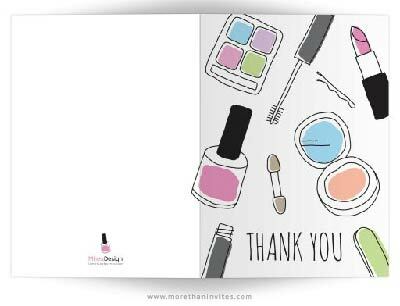 A folded makeup thank you card featuring lipstick, nail varnish, mascara, eye shadow and powder in a hand drawn doodle style. Text: “Thank you”. Blank inside. Matches the doodle makeup birthday party invitation but could also be used as a thank you card for a makeup artist or beautician. Available from Lemon Leaf prints.